The Surrey Eagles will conclude the 2012-2013 regular season on Saturday night with their eighth and final match-up against the Coquitlam Express at the South Surrey Arena. The Birds have won six of seven games against Coquitlam including an 8-1 win at the Poirier Sports Complex on Friday night. 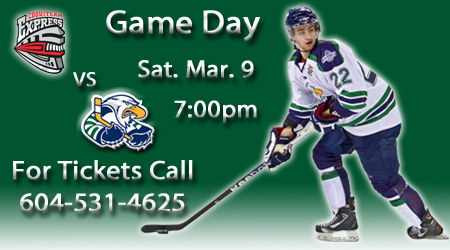 Heading into the final game of the season, the Eagles know that a win will clinch first place in the BCHL's regular season standings. The Birds haven't won the Ron Boileau Memorial Trophy since 1997, a season in which they won the Fred Page Cup and went all the way to the Royal Bank Cup before losing to Summerside in the final. The Eagles will also hand out their annual player awards prior to the game. The Express will close out the season on Saturday as they won't be heading to the playoffs. With the end of the year comes the end to the junior hockey careers of seven members of the Coquitlam club. Brad Ryan, Zach Pryzbek, Brandon Morley, Malcolm McKinney, Cal Hofford, Michael Maciag and Cole Huggins will all be moving on after the end of Saturday's game. The Express will be looking to play the spoiler and pick up their first win at the South Surrey Arena this season.